Some of the more "nervous" personality cats are easily stressed by many things - a new baby, loss of a pet, visiting family member, loud noises, other cats, and so on. What is surprising to many people is that even the more "laid back" cats can become stressed, even if outwardly still calm. While some of the stress scenarios will be obvious, some will not, and you may never know why your cat is stressed. Even mundane things such as loud music or traffic can be annoying to cats - they hear much better than we do. Same goes for any odors that they may come in contact with that we may never smell. During a major remodel years ago, we created a "cat room" that the cats could retreat to at any time they felt like it, and it was only accessible to them - no dogs and no kids. This was immensely helpful for stress reduction. Multicat household: give each cat some "space" - a safe place to retreat to, away from other cats, people, and pets. Multicat household: have at least one litterbox per cat, an extra one or two boxes above that is great. Multicat household: offer food separately - either in different locations or with cats separated to ensure that everyone can eat in peace. Multipet household: ensure that the cat(s) have a place to get away from the dogs or other pets. Offer a variety of toys for fun, exercise and general distraction. Offer climbing spaces where cats can hide or perch from -- cats often like to be up high where it is "safe"
For vacations and other extended absences, consider a live-in pet sitter or boarding facility so your cat(s) are not as lonely or stressed about your return. 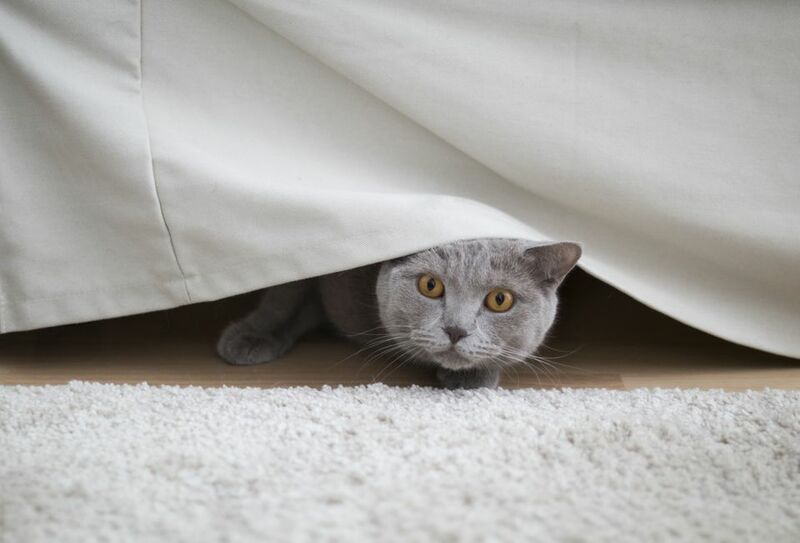 For a new baby or visiting guests in your home, try as much as possible to create a gradual introduction with a "safe place" for your cat to retreat to, if overwhelmed. It is often best to keep changes for your cat(s) to a minimum or at least with a gradual introduction when possible. Even small things, like keeping the brand of cat litter the same will help keep stress levels at a comfortable level. Another option is the use of an environmental pheromone treatment, such as Feliway to create some "feel good" moods of your feline population and hopefully reduce overall stress. If all else fails, please schedule an appointment with your veterinarian to discuss the current medical treatments that are available for pet behavior problems.